These support arms can be mounted quickly and easily onto the toilet. Either arm can be raised and folded away individually. 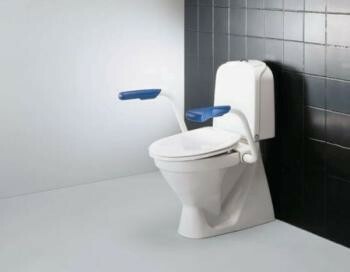 Support Arms for Toilet...These support arms can be mounted quickly and easily onto the toilet. Either arm can be raised and folded away individually. The individually folding arms give excellent support and the moulded handles are comfortable for hands and arms. Supplied as arms only or with a Dania Toilet Seat and lid. Maximum User Weight: 21 Stone (134kg). Width between arms 535mm (21"). Arm height from seat 235mm (91/4").